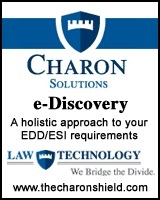 Charon Solutions has technical and legal expertise at your fingertips. If you have a pending legal issue or are concerned that an issue may result in litigation in the future, Charon Solutions can review a prior process � or certify a new one � and then back it up by providing an expert to testify on your behalf. We can also liaise with your existing legal department, outside counsel and/or IT department at your request. Sometimes the issue is so big that it spans an entire department. Not a problem. Our management consultants have been asked to step into these situations before and have provided excellent results for our customers. Charon Solutions has always recognized that there is no point in providing outstanding service to our customers if processes break down the moment we leave. We make sure that there is a proper hand-off � and that requires documentation. Charon Solutions provides the best documentation in the business.